Good news on the health insurance front! The stock prices for all these health insurance companies are up since they met with Trump. Thanks Republicans! We hear so many tragic stories about people who will go bankrupt and/or die because of the repeal of the ACA, and its pathetic replacement, that I thought Americans would want some good news about health care insurance. 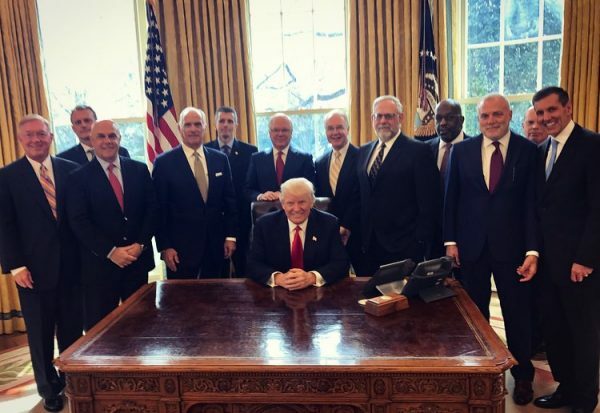 The stock price of every single publicly traded health insurance company represented in this photo has gone up since this photo* was taken on February 27, 2017! To determine what will happen next, look forward into what the men in this photo say they want every quarter on their financial conference calls.